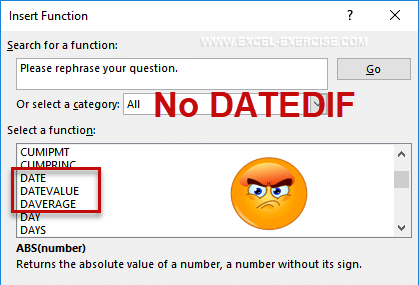 Calculate the difference between 2 dates is not an easy task in Excel. You must take in consideration if you want to return a result based on the gap of the months or based of the years, or both. The result between this 2 dates is 9 days. But the months are not the same. So if we use the MONTH function, the result is 1 and it's wrong, wrong, WRONG! The previous example showed that a difference between 2 dates is NEVER an easy calculation. But also, how do we want to return the result? Or by month in a year? To perform all these calculations, Excel has an incredible function to realize all the different calculation between 2 dates. It is the DATEDIF function. 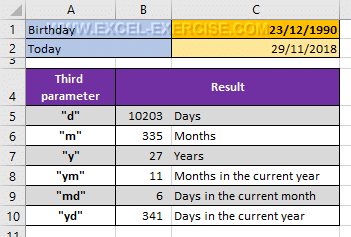 d (day) calculates the difference in number of days between the 2 dates. ym will return the number of months inside a year. Possible value between 0 and 11.
md will return a value between 0 and 30.
yd is less useful. This code returns the number of days in a year. Possible value between 0 and 364. In column B, we have the hiring dates of our employees. The second date is the current date returned by the TODAY function.